Indulge yourself in luxurious interiors that present a whole new level of relaxation. 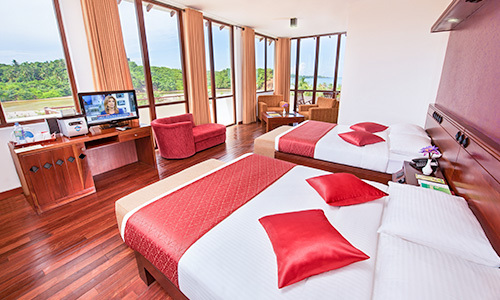 Offering the perfect combination of modern comfort and classic elegance, all accommodation options at Mandara Resort have been luxuriously appointed and tastefully decorated to bestow guests with much-desired quietude and comfort. Guests may choose from 29 majestic Standard Rooms, 4 Superior Rooms with private plunge pools and 12 lavish Deluxe Rooms with jacuzzis, each equipped with a blend of amenities to ensure a flawless stay. 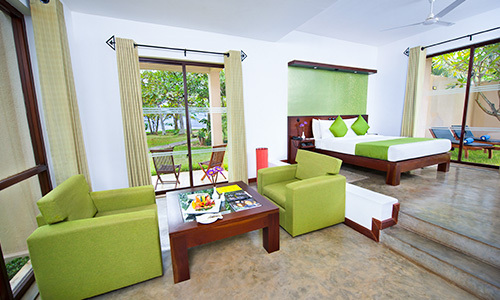 Mandara Resort Mirissa is the ideal choice amongst Mirissa beach hotels for your next tropical beach escape in Sri Lanka. 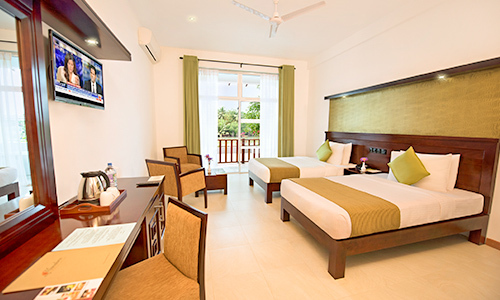 Superior sea view Rooms at Mandara Resort are ideal for guests who desire spacious and extravagant living spaces. Laze the hours away in your delightful getaway and let gentle breezes and the hum of the ocean lull you to sleep each evening. These luxurious and indulgent self-contained rooms are the epitome of subtle elegance and charm. Superior room with Plunge Pool Sea Side Offering guests 992 square feet of sheer luxury, Superior Rooms feature separate living areas and Terrace, presented in timeless elegance and charm. Equipped with amenities including a private plunge pool for the rooms located on the ground floor, these rooms combine the opulence of a palace with the comforts of home. Deluxe room with Jacuzzi Sea side Escape from the rest of the world to your very own Deluxe Room and lose yourself in blissful solitude and the sheer decadent luxury of your cozy confines. All rooms feature two king-sized beds and a wide array of amenities including a private Jacuzzi as well as a rain shower area.